There is nothing better on a summers evening than sitting out in the garden with a cold glass of wine and taking in the wonderful smells and listening – listening to the birds calling and cooing, the green tree frogs racketting in the drainpipes, the catyatids drumming down in the creek ( and the mosquitoes buzzing!) But, most of all, just drinking in the fragrances. 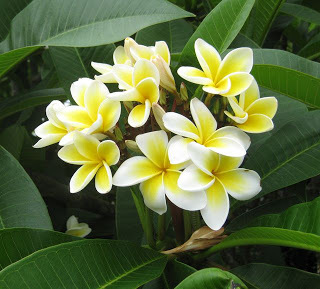 At the moment it’s mostly from white flowers: magnolia, gardenia, frangipani and mock orange. 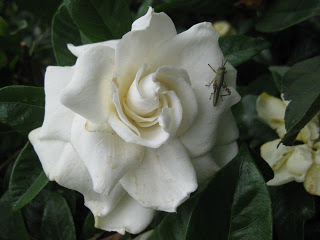 If you have ever wondered why white flowers tend to smell at their most fragrant at nightfall it is because they are mostly pollinated by moths that find their way to the flowers by the white glow of the petals and strong perfume – plus the seduction of nectar. Vita was a disinherited aristocrat who made her money by writing – she had a long running gardening column in the English dailies – on the periphery of the Bloomsbury Group. Her husband and she were both actively bisexual – now that would make for an interesting marriage! – but, if their letters and diaries are anything to go by, they loved each other to their dying days. Harold, a British diplomat, was appointed to the court of Shah of Persia and Vita’s story of her trip overland to meet him in Tehran for the Sha’s coronation makes fascinating reading (Passenger to Tehran, 1926) Harold too was a wonderful writer and diarist of his life and times – his books still make fascinating reading. At Sissinghurst she wrote in a tower with a view over her beloved White Garden – while Harold, the children (two sons) and a few servants lived in outbuildings scattered over the estate (sounds sensible to me!) I was recently listening to an old interview with her son Nigel who said that, in his mother’s lifetime, he was only allowed twice into her tower. The White Garden, viewed from her tower, was created to glow in the dark on moonlit nights – to comfort, inspire and perfume her solitary musings. It also broke a lot of gardening ‘rules’ i.e. 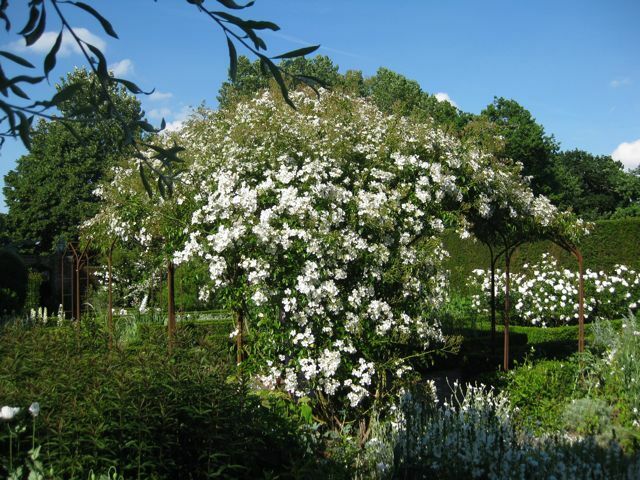 massed plantings of one colour and using a living structure as support for a climber (in the centre of the White Garden was an old apple tree and growing through it was a white climbing rose cascading over the branches – a wonderful sight to behold). The apple tree has long gone but the rose is still there supported by a conventional pergola. Sissinghurst, and English gardens of the same era like those of Gertrude Jekyll, Edward Lutyens and the Lloyds at Great Dixter, created a template in garden design that has been enjoyed and copied over and over again ever since – that is, formal design (creating rooms within rooms) and informal planting. Now we get to the regal queen of the garden – a particular favourite of mine. 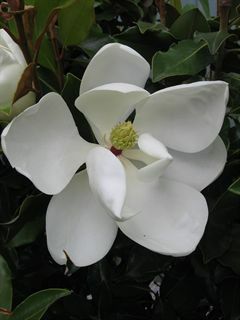 It is worth having a Magnolia grandiflora ‘Little Gem’ for the fragrance alone – subtle lemon with jasmine undertone – let alone the flowers – wow!!! I have had one in a pot, as a focal point in my garden, for about five years. It will happily keep on flowering as long as you prune off the old flower heads because it only flowers on the current seasons growth (plus you don’t want energy wasted going into making seed heads). This is a very underused plant in Australia which, in the warmer parts of Europe have taken to their heart. 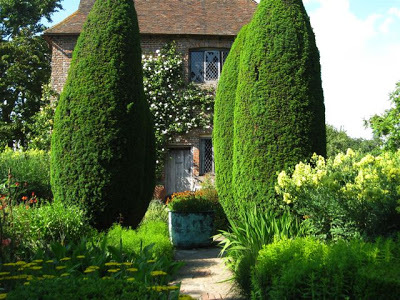 I was amazed the first time I saw this beautiful plant (not the dwarf one) espaliered all over the side of an old villa in France – then seeing it repeatedly used in the same way in Italy and Greece. There are no rules for this, just fun and beautiful results. Try out a ‘Vita garden’ in a spot at your place with white flowers and plants with silver foliage – it doesn’t take long to see and smell the results. 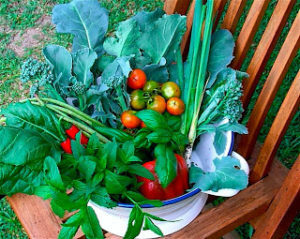 If you don’t have room, all of the plants mentioned make fine pot specimens – just be generous with the pot size and remember to feed them because they don’t have access to nutrients from the soil. 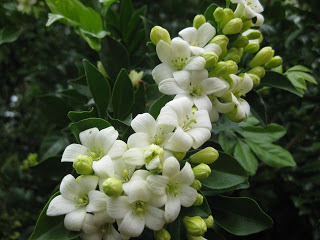 NOTE: A friend, whose eyesight is not so good, told me that she has recently planted the lovely native shrub/herb Cats Whiskers( Orthosiphon aristatus) along the path to her front door to ‘light’ her way home in the dark.